One of the largest and most impressive maps of Scotland to appear in the 18th century. A New and Correct Map of Scotland or North Britain with all the Post and Military Roads, Divisions, and ca. An absolutely stunning and monumental 1794 wall map of Scotland by Lieutenant Campbell. Covers Scotland in full with extraordinary detail throughout. Notes every town, hamlet, bishopric, country, forest, castle swam and road. Even offers some offshore detail with regard to the various postal ferries, the Marrs Bank, rocks and other undersea dangers, and cod fishing grounds. Identifies a number of important locales including Loch Ness, the source of the Spey, Ben Wyvis mountain, the Rock of Islay, Ben Nivis Mountain, and the ruins of Beregonium ancient capital of Scotland. A large inset map in the upper right quadrant details the Shetland Islands. An elaborate baroque title cartouche appears in the upper left quadrant. Published by Laurie and Whittle as plate nos. 7-8 in the 1797 edition of Thomas Kitchin's General Atlas. Duncan Campbell (fl. 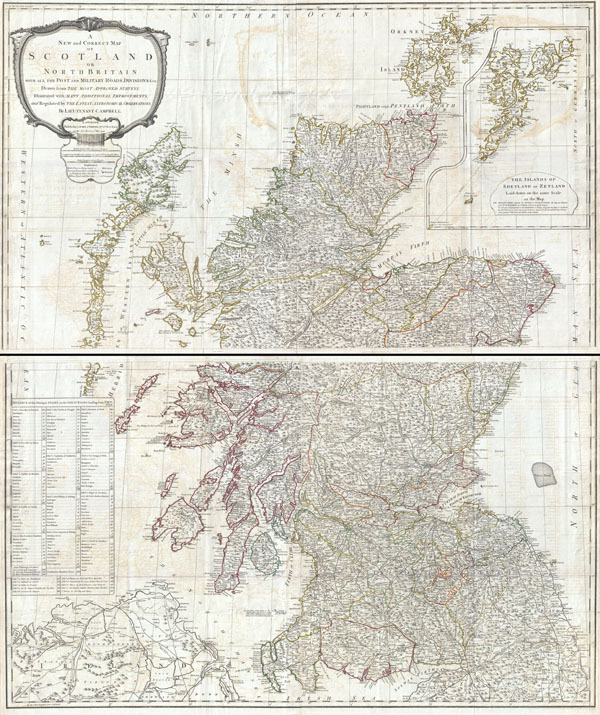 1750 - 1800) was an Scottish cartographer and surveyor employed with the British Admiralty. Campbell has proven to be an elusive figure, however, "Lieutenant Campbell" as he is referred to on his famous map of Scotland, may in face refer to Duncan Campbell, who was associated with both the Admiralty and the British Post system. Very good condition. On four sheets, top two sheets jointed by publisher, bottom two sheets joined by publisher. Top section and bottom section are unjoined, but can be joined upon request from buyer. These also framed quite dramatically separately. Original folds exhibit some wear and minor verso repair and reinforcement. Platemark visible. Blank on verso. Size indicated is for the entire map, joined. Individual sheets are half as tall. Rumsey 0411.011, 0411.012, 0411.013, 2310.013, 2310.014, 2310.015. Phillips (Atlases) 4300. National Maritime Museum, 375 (3rd ed. 1801).